Custodian of the two holy mosques King Salman received US Secretary of State John Kerry and his accompanying delegation, at his office at Yamamah Palace today. During the meeting they discussed bilateral relations between the two nations, in addition to reviewing a number of issues of common interest, including current situation in Yemen. At a news conference in Djibouti, a nation that Kerry visited on his way to the KSA, he said the United States was deeply concerned by the worsening humanitarian conditions in Yemen – “The situation is getting more dire by the day,” Kerry had told reporters. A joint press conference was held with Kerry and Saudi Foreign Minister Saud al-Faisal, at which the Foreign Minister said Iran was “taking over Iraq,” referring to the ongoing offensive led by Iran-backed militias on the city of Tikrit. 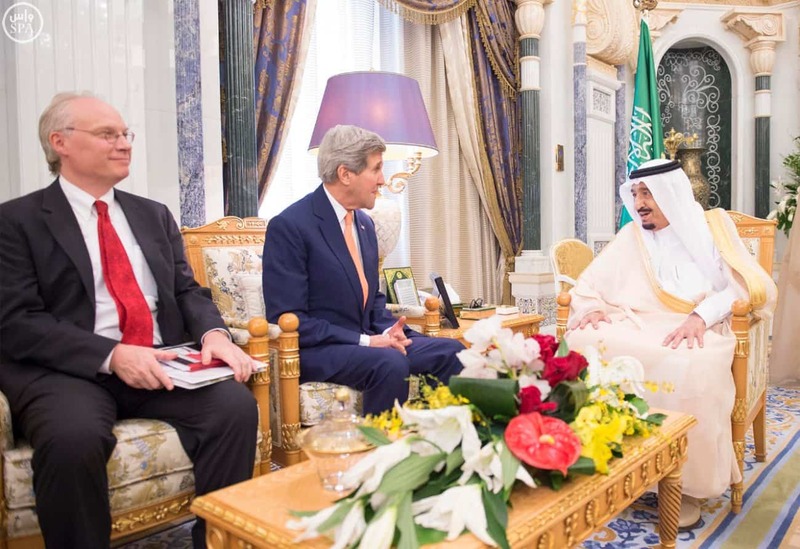 During his visit to the KSA Kerry also held talks with other Gulf foreign ministers, briefing them on the progress of U.S. nuclear talks with Iran and offering a reassurance that any deal with Iran would not damage their interests.